I guess, like anything, you pick up tips along the way and get to know what you really need to have and what is just going to take up room you don't have. I am someone, who doesn't like my hand luggage to weigh more than myself, especially where most of the flights I take, I'm transiting somewhere. I like to walk around duty free and not feel like my arm is about to fall off from the weight of my bag! 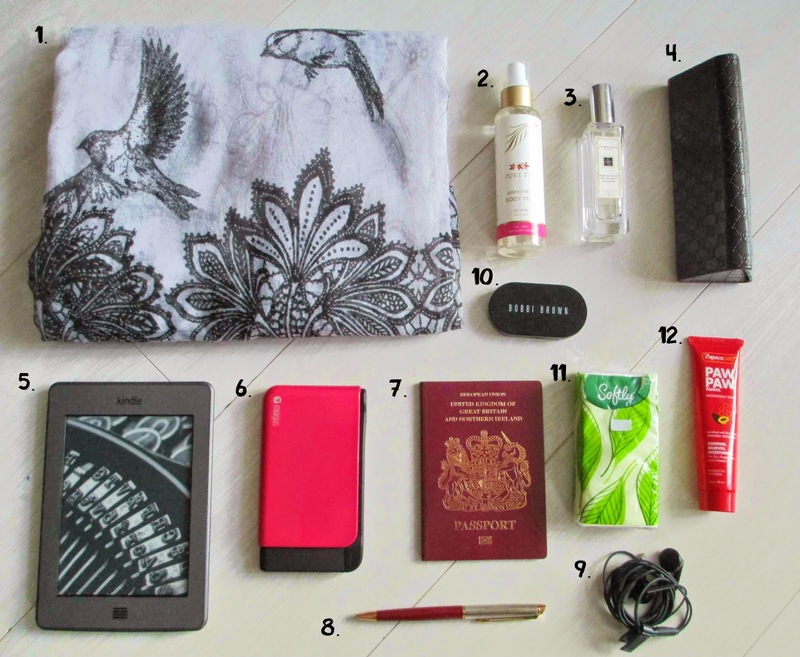 So, here we go, a smallish list of "What Is In My Hand Luggage". Scarf~ This item is an essential for me, I do find most airport lounges and planes that I have been on, are extremely cold. Plus, its light to carry and easy to wrap up in your bag. Hydrating Body Mist, Pure Fiji~ This is something I purchased recently, when I was in Fiji. It is 90ml, which is perfect to take on the plane (below 100ml liquid allowance). It is important to keep yourself hydrated on long flights. All I have to do with this, is spray it over the areas where my skin is dry, you can even spray in your hair and the smell is gorgeous. Perfume, Jo Malone~ I try to always carry a small bottle of perfume with me, especially when I am on a long flight. Reading Glasses, Gucci~ I keep my specs to hand, so I can read my Kindle and watch films. Kindle~ I got a kindle recently and took it on my last trip for the first time. It's light, compact, doesn't take up any space at all and you get to enjoy several books in one space. Power Bank, Moigus~ This has been my saviour , when travelling and otherwise. I am always on my phone, so this is perfect to keep it fully charged. Passport~ I keep this in the inside pocket of my bag, that I can zip up, so it is kept secure. That way, there is no possibility of it accidental falling out. Pen~ I carry a pen, in case there is a landing card or entry card to complete. Headphones~ I've finally got round to putting music on my iphone, so this is a must for me, as I always like to listen to my music on the go! Concealer, Bobby Brown~ I know this seems superficial, but, if like me, you suffer with dark circles under your eyes.....this is an essential! I always carry my concealer with me wherever I go, so I can touch up, if need be, when I arrive at my destination. Tissues~ I always feel cold on planes and suffer from allergies, so need to keep tissues to hand. Lip Balm, Paw Paw~ This is a must for me! Again, it is all about keeping yourself hydrated. so I am constantly applying balm to my lips to keep them moisturised. I hope you have enjoyed finding out what I carry in my Hand Luggage and maybe found some of it handy. Do you carry similar items with you on your travels? Is there any other useful items/tips that you could suggest? Please feel free to comment below.